Apparently it does :). 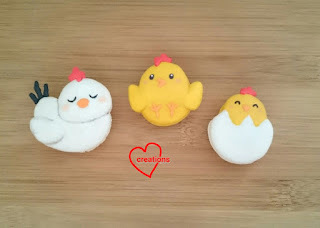 Presenting my hen and baby rooster macarons using a reduced sugar recipe :). In time to welcome the year of the rooster! I have written detailed write-ups of the basic French method using a ratio of ingredients that gives it a higher chance of success here and here so I will not elaborate on the techniques involved in this post. This higher chance of success comes about mainly due to the higher sugar content in both the meringue and powdered ingredients. I decided to try replacing about 12% of the icing sugar with a mix of rice flour and cornflour. 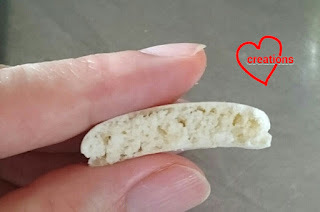 I explained in my Italian method reduced-sugar recipe post that although rice flour can substitute icing sugar, it extends the drying time by a lot. Therefore some cornflour has to be added to help the shells dry faster. However, too much cornflour makes the texture more chewy and surface of the shell less smooth. I have decided to try making more than one coloured batter using a single batch of meringue too. 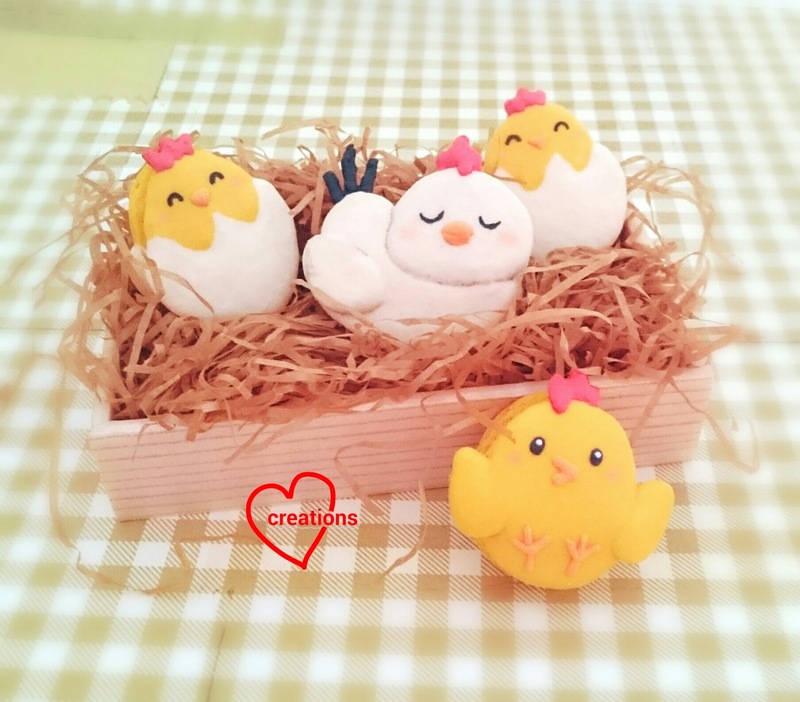 If you would like to work in small batches, French method is good for that although the risk of overfolding is higher and colour adjustment is more tricky. 1. Prepare baking tray with template and baking sheet. Weigh the bowls for beating egg whites and for the dry sifted ingredients. This is to help you divide the meringue and sifted dry ingredients later on. 2. Sift the almond powder, icing sugar, rice flour, cornflour and salt together. Divide into two equal portions. Add coloured yellow and white powder to the respective portions of using powdered colouring. I used about 1/4 tsp of white powder and 1/4 tsp of Queen's natural yellow powder food colouring. 3. In a clean metal bowl, beat egg whites with cream of tartar until stiff peaks form, gradually adding caster sugar. Divide meringue into two equal portions. Add a drop or two of gel food colouring into the meringue if you wish. 4. Scatter the powder ingredients into the meringue and fold. Repeat in 3-4 additions. When the dry ingredients are more or less incorporated, scoop out about 1tsp of yellow batter and add red gel to colour it red. 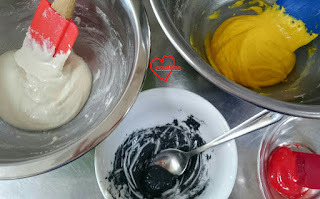 Scoop out 1 tsp of yellow batter and add 1/16 tsp charcoal powder to colour it grey/black. It is ok to overfold this small portion. Continue folding the main white and yellow batter until consistency is slow-moving lava-like. Please refer to my video tutorial to see how this consistency should be like. 5. 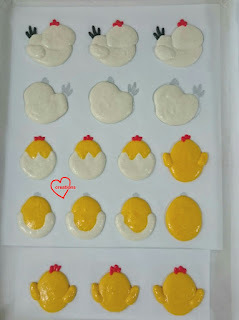 Transfer yellow and white batter into piping bags fitted with Wilton #7 or 8 round tip. Transfer black and red batter into piping bag with a small 2mm hole cut at the end. 6. Stick the baking sheet down to baking tray with a bit of batter. Pipe away! 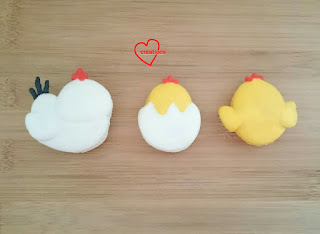 Please refer to this post for video tutorials on how to pipe complex shaped macarons. 7. Dry the shells in aircon room or under the fan. If you want to, you may use a hair dryer to speed up the drying process. Preheat oven to 160°C with rack at lowest position. 8. Reduce temperature to 140°C when tray is in the oven. Bake for 8-9 minutes. Reduce the temperature to 120°C and bake for another 3-4 minutes. Rotate the tray and bake for another 10 minutes at 110°C or until the feet doea not appear wet. Use an oven thermometer at all times! 9. Cool the macarons completely before peeling the baking sheet away from the shells. I taste-tested the shells. Texture is pretty much the same as the non-reduced sugar version! It's a pity I forgot to take a photo :p.
Update (13/1/17): I did another batch of chicken macarons so I took a photo of the cross-section. Take a peek at the texture! Decorate with royal icing and edible marker. 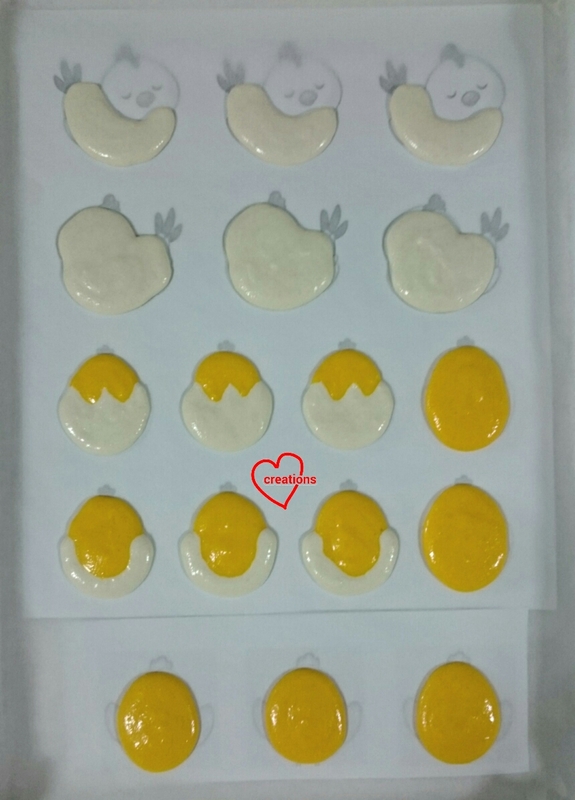 I filled the macarons with lemon white chocolate ganache and lemon curd. Recipe can be found here. These are for a friend and her hubby for their wedding anniversary. Both of them were born in the year of the rooster so it's a really fitting gift for them :). Hello Phay Shing. Bought your book and enjoyed looking at all the designs. 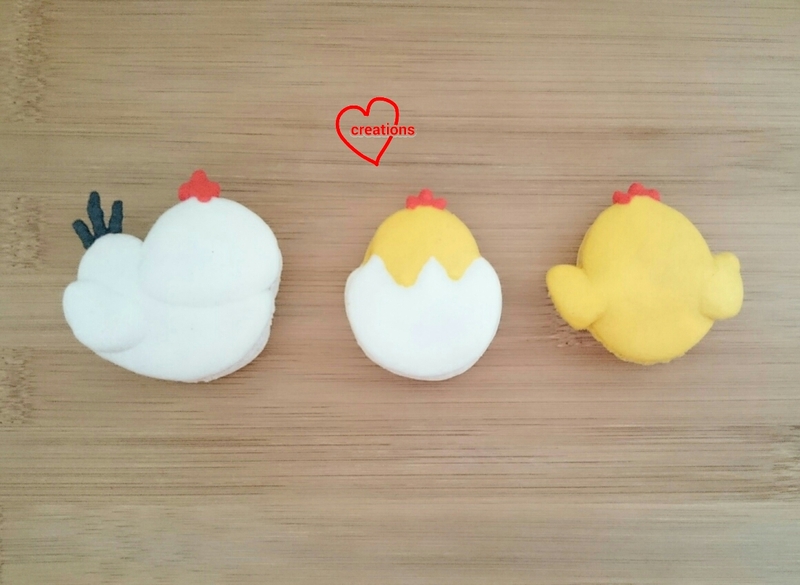 Today I tried my hand on the reduced sugar version of round chicks. 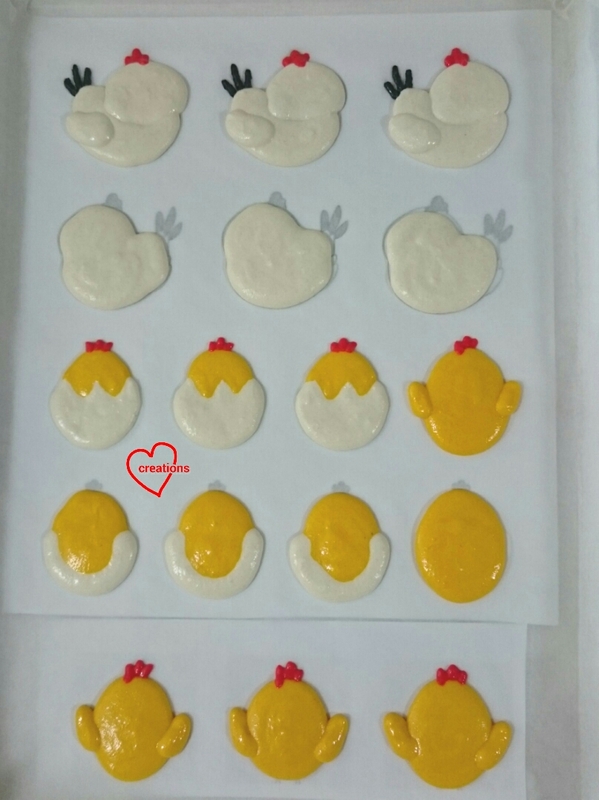 Being too lazy to make a tiny bit of royal icing, I coloured a bit of batter orange and black for the chick's features and used a toothpick to apply them. Sadly they're cracking and misshapen while the plain ones without any features, meant for the bottom, are so far looking fine. 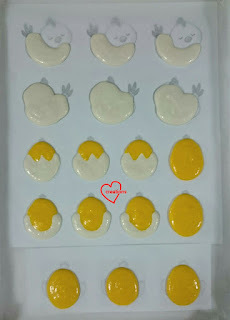 Have you tried using batter for the features and finding the macarons crack or become misshapen? Possibly overstirring that bit of batter? Yes I have done what you did on a number of occasions. You may take a look at my snowman macaron last year. 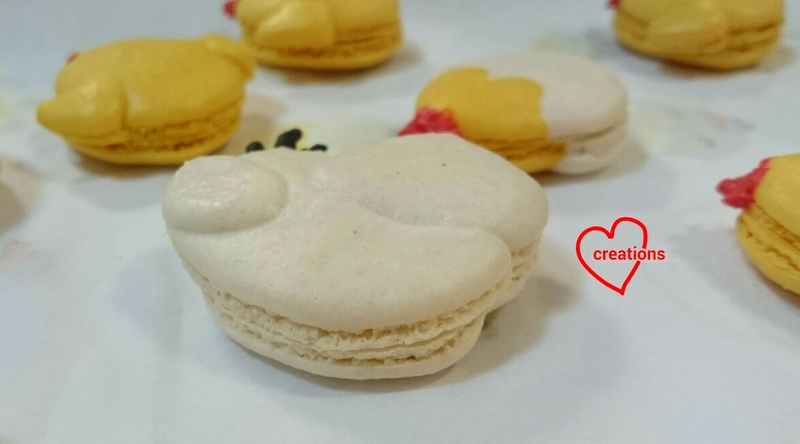 All features were done using macaron batter. Just let the shell dry thoroughly before baking and it shouldn't crack :). Batter that has been manipulated with toothpick will tend to take longer to dry so do be patient. Where do you get your templates from? Thank you for the reduced-sugar recipe. Is it possible to double this with good results? hi, im also wondering if I can double or triple with good results? thank you for the recipe~!